The included software (Pro Tools First & Ableton Live Lite) lets you easily edit your recordings to a professional level right in your own home. From the great value starter pack right through to the high-end model (rack mountable with 18-in and 20-out), there is something for everyone from beginner to pro! 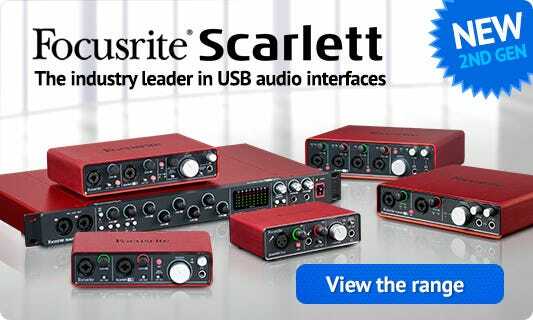 Scarlett 2i2 - The top selling USB interface in the world, for recording studio-quality audio. Headphones - HP60 closed-back studio headphones for blocking out background noise. Microphone - CM25 large diaphragm condenser mic for capturing crystal clear sound. Mic Cable - a 3 metre XLR mic cable and stand clip. Focusrite's compact and flexible 2-in, 4-out USB audio interface makes it easy to perform and record studio quality audio against a cue mix. Take it anywhere, connect by USB and get two natural-sounding Scarlett mic preamps, super-low latency, MIDI I/O, four analogue outputs and the same class-leading sound quality and digital conversion as the rest of the latest Scarlett range.